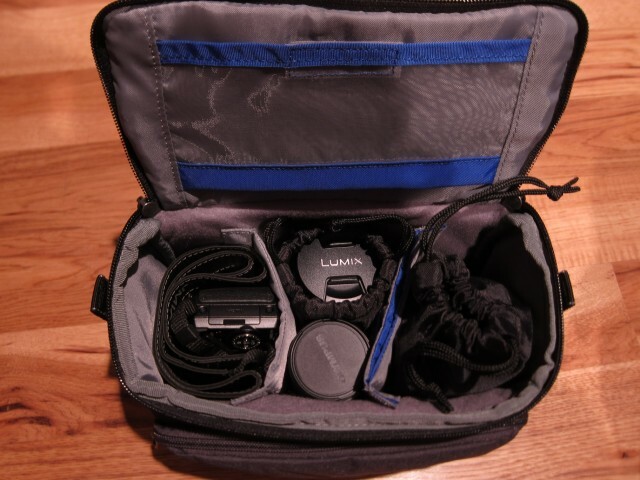 Ever since getting the Panasonic Lumix GF5, I have been looking for a good camera bag for it and a few lenses. While on some trips I can get away with just the 20mm prime, there are cases when I want a zoom lens or a macro in addition. After a little searching, and asking the opinions of others, I ended up buying the Think Tank Mirrorless Mover 20. Of the various options available for a mirrorless camera, the one thing that really makes the Think Tank stand out is the rain cover. While the bag is a little spendy compared to the other options out there, the extra cost can be felt in the product. It’s one of the more solidly built bag/backpack that I’ve purchased in a long time. Size wise the Think Tank Mirrorless Mover 20 is about the size of an average soft ‘lunch pail’. I was able to fit my GF5+20mm, 60mm macro, 14-42mm (kit lens), and 45-175 telephoto into the Mirrorless Mover 20. I don’t see my self carrying more than that lens wise (only really missing a nice wide angle lens). Above is a picture of the lenses and camera in the Mirrorless Mover 20. The only thing I wasn’t able to fit in the Mirrorless Mover 20 was my Joby GorillaPod with the three extra lenses, remove one and it fits perfectly. Honestly, a little more efficient packing on my part would allow the GorillaPod to ride along too. Even since purchasing my Panasonic GF5 last winter, I’ve wanted a macro lens. Those who are familiar with the micro four thirds system know that there are only two macro lenses for it. The quite expensive Panasonic/Leica 45mm f/2.8, and the newer and slightly less expensive Olympus 60mm f/2.8. Currently, Olympus has some decently sized instant rebates on a large selection of lenses, including the 60mm f/2.8 macro, so I picked one up. 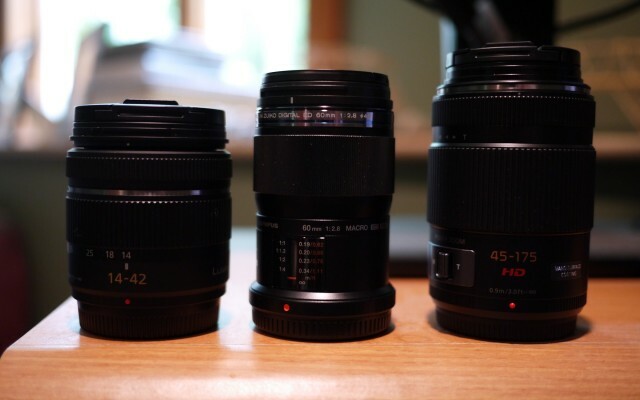 Above is a side by side comparison of the Panasonic Lumix 14-42mm, Olympus 60mm macro, and the Panasonic Lumix 45-175mm. In comparison to all the Panasonic lenses I have, the Olympus is quite narrow. This makes it look much longer in the product photos than it really is. Below is a set of sample picture I took when playing around with the Olympus 60mm on my GF5. A few things to note, in several instances the GF5 had trouble getting the lens to focus (lots of back and forth focusing). I had better luck using manual focus mode. Additionally, the depth of field of the Olympus 60mm at f/2.8 isn’t very great. I ended up going into aperture priority mode to stop down to f/5 to get a reasonable DOF. Always keeping an eye out for camera deals, back in November a deal on the Panasonic Lumix GF5 caught my eye. While I love my S90, something with a larger sensor that would allow me to do more in lower light situations (though I realize it isn’t any better than the S90 for long exposure). After unpacking my ProLiant MicroServer (it will replace Atomtux as the Atom 330 just isn’t cutting it anymore speed wise), I was expecting to see a packet of screws for the hard drive bays (has a 4x cold swappable 3.5″ SATA HDD bays). Alas, there was no packet. After a little searching, I found the screws, along with a wrench for them. They are attached to the door covering the hard drive caddies. 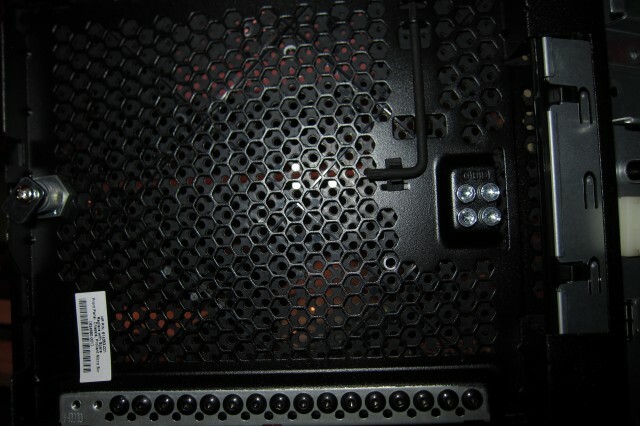 There are 16 screws attached to the door for hard drives, and 4 for an optical drive (to be placed in the 5.25″ bay). Yes, there are 4 extra hard drive screws (one bay comes populated with a 250GB Seagate hard drive).